How real-life G20 protests became part of a fictional film, now showing at TIFF. When filmmaker Andrew Cividino began shooting his short film We Ate the Children Last in June 2010, he wanted to create a dystopian setting to match the dark narrative. Part way through filming, however, he found himself in the midst of a real police state in downtown Toronto. 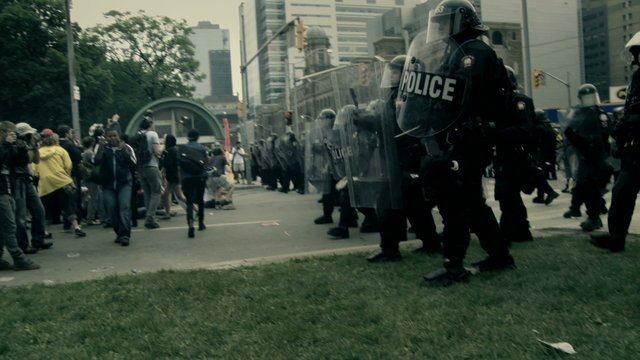 The film, which premieres this week at TIFF, is set in the future, but Cividino and his crew shot their riot footage smack in the middle of Toronto’s G20 weekend. Based on the Yann Martel short story of the same name, We Ate the Children Last is a science-fiction cautionary tale about a new medical procedure that has scientists transplanting pig organs into humans to fight cancer. The transplants have some serious side effects, and it’s not long before mayhem ensues, complete with protests, violence, and a media frenzy. Into the action they went, complete with signs reading “To hell with pigs”—placards that the actors, who were playing anti-transplant activists, were to hold. Never mind that the pigs they were referring to were not police officers, but rather barnyard animals; the team soon found themselves surrounded. While the cast and crew made it out of the weekend relatively unscathed, Cividino couldn’t help but notice the irony of their experience. “There were parallels between things in the script and things that were actually happening [at the G20]. Part of the film is about exploring the role the media plays in how we perceive things, and what it’s like to experience a pandemic of fear in the post-9/11 world we’re in,” he says. In Cividino’s adaptation, the media’s role in the narrative is more detailed and intimate than in Martel’s story, with televised news channels and celebrities endorsing the pig transplants, which results in mass use. But when things start to get suspicious—housecats are lost, bodies go missing—the media launches a witch hunt against any individual who has had the surgery. The film also courts controversy through Cividino’s decision to use real footage within his cinematic narrative. The shots of the G20 are full of tension and panic, yet their inclusion within the plot makes it easy to forget that the cameras are showing real people in an event that actually happened. Cividino says that he and his crew spent a considerable amount of time considering the ramifications before deciding to keep the footage. “Our inclusion of this footage in We Ate the Children Last was done to highlight how fragile our security and comfort zone really are, and G20 couldn’t have served as a better case study of that,” he says. “We were inspired by social and political activism on that day, which happened before principal photography, and the rest of our shoot was flavoured by what we witnessed and experienced.” He adds that the crew was careful not to include any close shots of individuals. We Ate the Children Last will be shown on Wednesday, September 14, at 5:30 pm and Thursday, September 15, at 1:00 pm at the TIFF Bell Lightbox 2 as part of Short Cuts Canada.